The weapons proficiency figures for one-handed weapons and polearms were derived by experimentation, and may not be entirely accurate, as the program seems to use a relational algorithm to arrive at them. 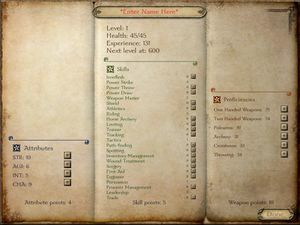 Rather than having classes to choose from, Mount&Blade lets you decide elements of your past which help determine your starting abilities and equipment and acts as a sort of difficulty setting. There is no randomness to your starting stats, so every time you choose a particular set of choices the base stats will be the same. Once you have chosen the aspects of your background you move onto point distribution. Once you have answered the background questions, you will see the character creation screen. First you have to decide whether you will be allowed to quit without saving. Enabling this will allow you to quit and reload your game to undo a disastrous battle or otherwise experiment with things. Once you have decided on a saving mode you get to distribute points to your skills and attributes (see those pages for more information on what each does). Before you can continue you must distribute all skill, attribute, and weapon points, and also give your character a name. Next you get to customize your face. You can rotate the face by holding and dragging around, and you can customize various features by moving the sliders or clicking the buttons. You can also click Randomize to have the game create a face (which you can then tweak if you wish). Once you're happy with your face, click Done to finish your character. You may change your looks later on, through the character page. 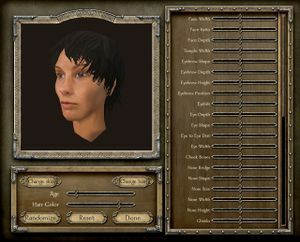 In Warband, after assigning your character's attributes, you additionally choose what city your character starts near. (In the original you start near a random training field.) You can choose from Praven, Reyvadin, Tulga, Sargoth (Karachi in Warband), Jelkala, and Shariz. Your choice here does not obligate you to associate with the faction that owns the city or affect you in any way other than the location you start in and some aspects of your first quest. Because of this, it is generally advisable for any character to start in Jelkala or Praven because the bandits in those regions are not as threatening to low-level characters as the bandits in other areas. This page was last edited on 7 October 2015, at 01:26. This page has been accessed 616,676 times.